The Left Want to Abolish ICE. What Does That Mean? Over the past several days, numerous prominent Democrats have sounded off on both sides of one issue: whether or not their party should support the abolition of the U.S. Immigration and Customs Enforcement Agency, or ICE. "I believe you should get rid of [ICE], start over, reimagine it, and build something that actually works," Sen. Kirsten Gillibrand (D., N.Y.) told CNN's Chris Cuomo Friday. "The president's deeply immoral actions have made it obvious we need to rebuild our immigration system from top to bottom starting by replacing ICE with something that reflects our morality and that works," Sen. Elizabeth Warren (D., Mass.) said Sunday. While some such as Sens. Bernie Sanders (I., Vt.), Tammy Duckworth (D., Ill.), and Richard Blumenthal (D. Conn.) oppose the movement, a growing chorus on the left is clamoring to "abolish" or "defund" ICE. That group includes at least three senators, five members of the House of Representatives, and more than 20 candidates for Congress and state Governorships. There is also a bill circulating the House intended to accomplish the group's goal. The movement has grown in response to President Donald Trump's crackdown on illegal immigration, with opponents labeling ICE "an opaque and racist deportation force." The general public does not seem to agree: a recent poll found 69 percent—including majorities of Democrats—opposed abolishing ICE. Abolishing ICE, as a bellwether for Trump's policy and a proposal in itself, may feature prominently in Democrats' rhetoric in the 2018 and 2020 elections. But what does ICE abolition mean? And, critically, what would the left see the agency replaced with? The slogan, radical as it is, obscures deeper divisions within the Democratic Party and the left over what immigration in America should look like after Trump. ICE is a division within the Department of Homeland Security that is responsible for immigration enforcement, smuggling investigations, and terrorism prevention. It's split into several subdivisions, including Enforcement and Removal Operations (ERO), which actually carries out arrests and deportations, and Homeland Security Investigations (HSI), which tackles drug- and terrorism-related issues. ICE has about 20,000 employees, with 400 offices and $6 billion in annual funding. ICE is not the entity directly responsible for policing the border—that is Customs and Border Protection, although ICE does deport some of the people CBP apprehends. ICE is also not the entity responsible for the recent family separation controversy—that is CBP again, which apprehends immigrants at the border, and the Department of Justice, which prosecutes them. This confusing jumble of three-letter agencies is a byproduct of recent history. Once, most immigration functions were under the auspices of an agency called the Immigration and Naturalization Service (INS), organized in 1933 and part of the Department of Justice for most of its history. INS was responsible for administrative matters pertaining to immigration law, including deporting immigrants who violated it. After 9/11 and the subsequent creation of the Department of Homeland Security, INS was abolished and its enforcement functions rolled into a new organization under DHS, which would address the national security angle of immigration: ICE. ICE is perhaps best known for its arrest and deportation of illegal immigrants in the interior, a practice that has shifted over its history. ERO-led apprehensions took off in 2007, hitting rates they would maintain through President Barack Obama's first term. 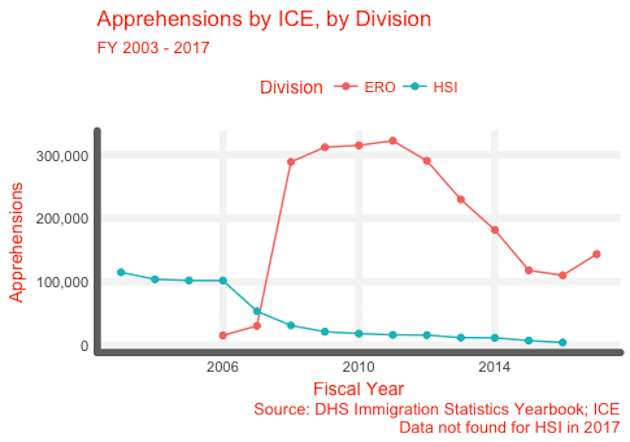 ICE apprehensions began to decline shortly thereafter, as Obama responded to pressure from pro-immigration advocates by cutting enforcement and focusing on criminal rather than non-criminal immigrants. Under President Trump, apprehensions have risen again, albeit not to the levels seen under Obama. Still, this upturn after several years of decline, combined with Trump's tough immigration rhetoric, is likely what prompted the aggressive response of opponents of serious immigration enforcement. Why Does the Left Want to Get Rid of ICE? There are a number of reasons. One is the scale of apprehension and deportation its detractors claim it permits. 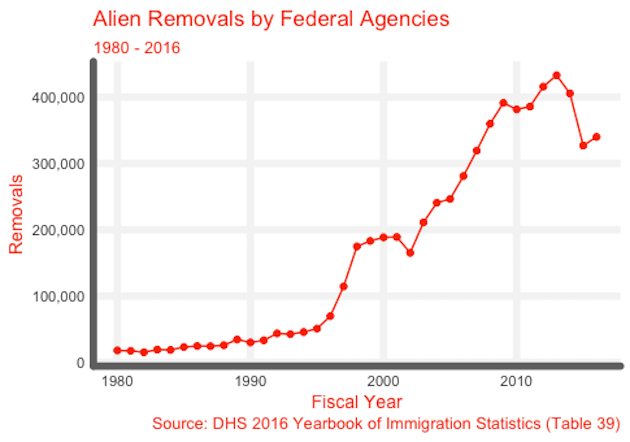 Removal of illegal aliens as recorded by the federal government have risen steadily for decades, but that rate of change increased after DHS's founding, a phenomenon that some analyses have attributed to ICE. Notably, immigration enforcement rose alongside a surge in illegal immigration to the United States. The Pew Research Center has estimated that the illegal immigrant population more than doubled, from 5.7 million to 12.2 million, between 1995 and 2007. The illegal population flattened thereafter, however, even as enforcement increased. The number of deportations began falling in 2013, with deportations by ICE specifically—as opposed to inclusive of other agencies like CBP—beginning to drop a year earlier. Indeed, the total deportations by ICE in 2017 were at their lowest level ever, although it is likely that that decline will not persist in 2018. Critics also argue that ICE is indiscriminate in who it deports, targeting illegal immigrants who have committed no other crime than illegal entry. Such operations can mean the splitting up of families and the deportation of otherwise law-abiding longtime residents people. Historically, ICE ERO has targeted people under a set of priorities that includes convicted criminals, but also immigration law violators more generally. In its last two years, the Obama administration narrowed these priorities, replacing them with a focus on "convicted criminals and others who pose a danger to public safety." President Trump has returned ICE to the more expanded set of priorities, prompting what critics have called an "end" of enforcement priorities per se. "In this era, ICE has just taken off the gloves, going full throttle without regard to consequences," Katrina Eiland, a staff attorney for the American Civil Liberties Union's Immigrant Rights Project, told the Pacific Standard. "They don't have any logical enforcement priorities anymore—everyone is an enforcement priority." The ACLU declined a request to comment to the Free Beacon for this story. Pew found that criminals accounted for 74 percent of apprehensions made as of February, a marked decline from much of the Obama administration. Notably, Pew estimated that the proportion of criminal aliens apprehended remains substantially higher than historical norms, at least through FY 2009. 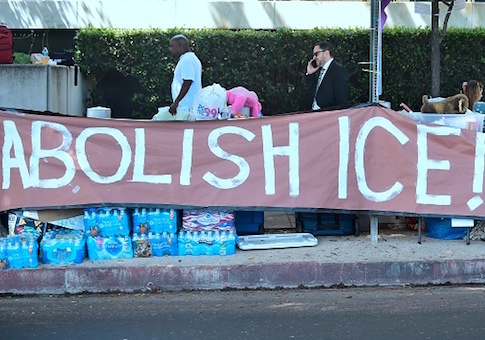 Both of these concerns flow naturally into the broader argument of some—although by no means all—ICE abolitionists, which is that the very act of deportation is, in and of itself, unjust, and not something government should be in the business of doing. One of these critics is Sean McElwee, a New York-based writer and progressive data analyst who is regarded—by himself and others—as a leader of the Abolish ICE movement. "Next to death, being stripped from your home, family, and community is the worst fate that can be inflicted on a human, as many societies practicing banishment have recognized," McElwee wrote in the Nation in March. "It's time to rein in the greatest threat we face: an unaccountable strike force executing a campaign of ethnic cleansing." What Would ICE Be Replaced With? The short answer is: it is unclear. At least one legislative proposal, from Rep. Mark Pocan (D., Wis.), is expected later this week. In a Tuesday op-ed, Pocan wrote that his bill would "dissolve ICE within six months and create a commission to provide recommendations to Congress on how the US government can implement a humane immigration enforcement system that upholds the dignity of all individuals." (Pocan's office did not provide the Washington Free Beacon with further details.) Other officials who have backed abolition, such as Gillibrand and Warren, have not yet proposed alternatives, although they have made clear that they want some form of enforcement. With the emphasis placed on DHS's roll in the current debate, there has been some discussion of reestablishing INS, which advocates say would make immigration an issue of justice rather than national security. Leftist darling Alexandria Ocasio-Cortez, who has made ICE abolition one of her platform points, outlined such a proposal. "Like warrantless wiretapping, the extrajudicial and unaccountable nature of ICE is essentially built as a maiden in waiting for authoritarian abuse of power," Ocasio-Cortez wrote on Twitter in May. "In fact, the folks who panic about the idea of #abolishICE seem to forget that we had a system before it: the INS." However, it is not obvious that INS was the immigrant-friendly regime that current ICE critics might think it was. As Bill Scher noted at RealClearPolitics, the organization itself was a routine target of criticism from the left. 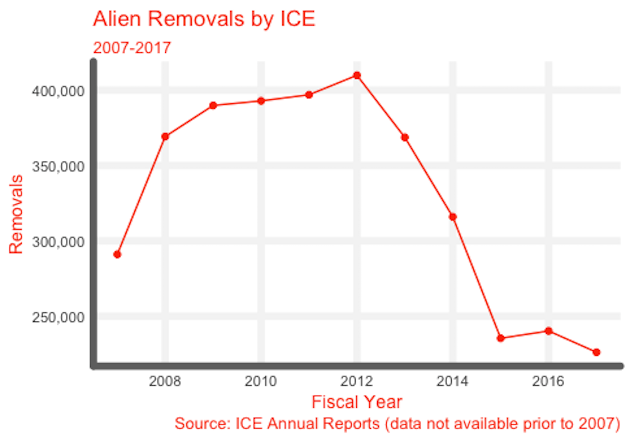 It also oversaw the takeoff of mass deportation, as shown above; ICE ERO did not really start contributing until 2007. INS also targeted non-violent-criminal immigrants for deportation. Interior deportations under INS totaled more than 138,000 people in FY2000, a number which included but was not exhausted by 71,000 criminal aliens deported. This means that Democrats who want to curb immigration enforcement may need to look further back than ICE's founding. They might end up revisiting the bipartisan Illegal Immigration Reform and Immigrant Responsibility Act of 1996, signed into law by Bill Clinton and often blamed for beginning mass immigration enforcement. The Congressional Hispanic Caucus, a Democrat-controlled group in Congress, has opposed ICE abolition in favor of legislative changes. A Daily Beast report on the CHC's talking points on the issue note that the group wants to see "increasing transparency and accountability" for ICE, and emphasizes Trump's policy, rather than problems with the agency itself. Advocates like McElwee see major reform, going beyond ICE abolition, as necessary to their goals. "It's a big concern—the idea of this very grassroots immigrant-organizer-led movement turning into, ‘abolish ICE and then re-form it, and we'll call it ‘ICL,' or something," McElwee told ABC. "If you still have mass deportation, you have not abolished ICE." Representatives of ICE and its agents' union, the National ICE Council, did not respond to requests to comment for this article.